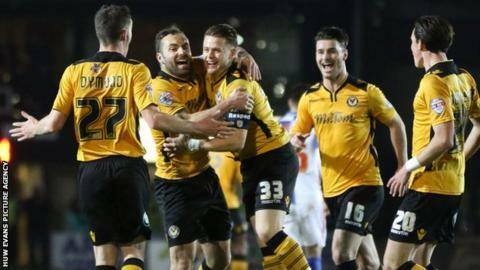 New manager Warren Feeney says he hopes to add to Newport County's depleted squad in the coming days. County want to strengthen their squad after losing 2-1 to Blackburn Rovers at Rodney Parade in the third round of the FA Cup. The League Two side had goalkeeper Joe Day sent-off late in the game and Medy Elito carried from the field as their small squad was pushed to the limit. "Injuries are mounting for us," said Feeney, who succeeded John Sheridan. "That's part and parcel of football. The squad is going to get thinner, believe me. But I've got to get on with it. "We want to bring players in. I'm looking at strikers, maybe midfielders now as well because of Medy's injury." Former Northern Ireland international Feeney, who also expects departures from the club, revealed the extent of the injury to winger Elito. The 25-year-old was stretchered off after a challenge from Chris Brown that earned the Blackburn striker a straight red card after only 10 minutes. "He's had 10-15 stitches in his leg," Feeney added. "It is a gash and it is unfortunate. He was rushed to hospital - the medical guys are saying you could see down to the bone. He'll be out for a couple of weeks at least." Rovers had taken an early lead through a Ben Marshall penalty before Mark Byrne equalised from 25 yards. Substitute Jordan Rhodes headed home a superb late winner for the Championship side, who will meet Oxford United in the fourth round. Although disappointed with County's FA Cup exit, Feeney said staying in League Two was now the priority for the club, who sit 20th in the division and face fellow strugglers Dagenham & Redbridge on Saturday. "I thought they applied themselves well from where we are and the small squad we are," Feeney said. "Our main focus is the league and we look forward to Saturday."